Roaming Stamper: 500 miles in a day! I'm back in the hotel and I wanted to share with you our day yesterday. When the day was done we had driven right at 500 miles but we did oh so much on the drive. Here's how the day went: We left Torrey, UT (near Capitol Reef) around 8 a.m. and headed towards Kanab. 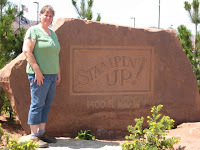 Kanab is where the manufacturing plant of Stampin' Up! is located and I had arranged for a tour. On the way we saw a sign for Bryce Canyon which is our favorite National Park. It was only 14 miles away so a side trip w as warranted. 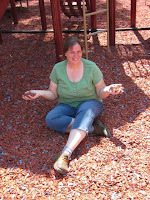 We agreed that we could only spend about 1 1/2 hours in the park since we still had a lot of area to travel. We stopped at several of the lower points and just marveled again at the unusual beauty of this park. It was SO HARD not to head down for a hike through the hoodoos but we just didn't have the time. 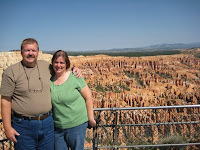 So, after a whirlwind tour through Bryce, we headed on to Kanab. We stopped for some lunch before heading on to the plant. 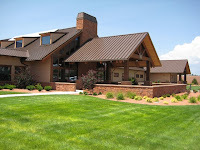 We arrived and we were greeted very warmly by Josh who is the head of Human Resources at the Kanab plant. He gave us such a great tour and answered all of our questions. Unfortunately, no pictures were allowed in the plant which I totally understand but I did take a few pictures of the building and common areas. I have to say that is was a fascinating tour. To see how the stamps are actually made was amazing and I have even more respect for the people who do it day in and day out. It's a very interesting process and I was so pleased to see the many quality control checks that happen throughout the process. Most of all I thank Josh and Stampin' Up! for allowing the demonstrators to tour the facilities. It makes me so proud to be a part of such a great company. If you read the post earlier, I left out a very important part of my trip to Kanab. 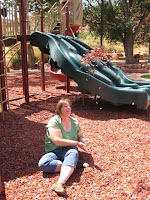 While we were there, we went to the city park that has been dubbed "The Park that Rubber Built". It was in a state of disrepair and Shelly and Sterling donated the money so it could be rebuilt. The coolest thing is that the fall zone is the chopped up rubber bits from stamp sets! I even picked up a few as a keepsake. Thanks for sharing your trip!! I can't go to convention because my family reunion is almost always the same weekend. So I love it when everyone else shares photos! Love all the chopped up rubber bits!! Thank you for sharing your adventures through Utah. I love Bryce Canyon too, and wish I was staying with my brother in Draper and driving into convention this AM. 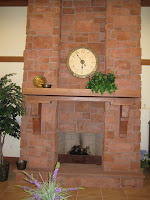 The sneek peeks are great for us Demo's who are stuck at home and living the experience through cyberspace. I am glad to hear you are enjoying my home of Utah! I can't wait to hear about convention, even though I live in SL, I couldn't afford to go this year.